To please the high-end smartphone lovers, LG has launched it’s most innovative smartphone, LG G4 featuring 64-bit Octa-core Qualcomm Snapdragon 810 SoC, 5.5-inch QHD display, 16-MP+8-MP Camera, Android 5.1 Lollipop and 3000mAh battery on 29th April in UK. Now up for pre-order in UK in three colour variant as Metallic Gray and Gold for £499.87 and a black leather variant for £529.87. Online retailer Clove has listed LG G4 as £500 for the standard black and gold colour variant and Amazon and Expansys listed for £599.99. LG G4 will be available from 28th May. 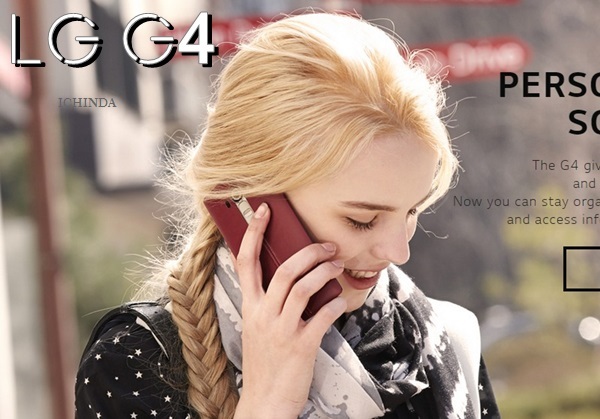 The all new LG G4 supports Single SIM, 4G LTE-A with tri-band carrier aggregation, HSPA+, Wi-Fi 802.11 a/b/g/n/ac, Bluetooth Smart Ready (Apt-X) 4.1, NFC, SlimPort, GPS/ A-GPS, GLONASS, and USB 2.0. offers you a 5.5-inch QHD IPS display with resolution (1440×1560 pixels) and a pixel density of 535ppi offers you crystal clear wide-angle view perfect for watching movies, playing games and reading e-books. LG G4 is powered by a powerful 64-bit octa-core Qualcomm Snapdragon 810 SoC with Adreno 430 GPU and 3GB RAM and latest Android 5.1 Lollipop OS with LG’s new UX 4.0 on top makes your multitasking a fun and gives superior gaming environment and allows to run your apps smoothly. It comes with 16GB, 32GB and 64GB storage variants with 128GB microSD card support including 100GB of Google Drive storage free for two years. LG G4 sporting a huge 16-MP Primary Camera with dual-LED, laser autofocus, f/1.8 aperture and optical image stabilisation (OIS+) for shooting in low light condition while 8-mp front camera best for clicking selfies and making video call. LG G4 is packed with a powerful 3000mAh battery with fast charging features which allows you charge your smartphone 60% on 40 min. It measures 149.1×75.3×8.9mm including innovative features like Gesture Shot, Glance View and Gesture View. LG has recently launched World’s best curved smartphone the all new LG G FLex2 with flexible display in India at 55,000 in Platinum Silver and Flamenco Red colour option LG G FLex 2 at CES 2015 which will be available in South Korean market on 30th Jan. 2015 in Platinum Silver and Flamenco Red colour option priced at KRW 800,000 (Approx. Rs. 45,400). Additional 100GB of Google Drive storage free for two years. ROM 16GB/32GB/64GB with 128GB MicroSD card slot with 100GB of Google Drive storage free for two years. LG G4 Rivals Apple iPhone 6 Plus, HTC One M9 and Samsung Galaxy S6. At last few honest word, LG G4 is the best smartphone for multitasking. What you think? Please be first to write a review.